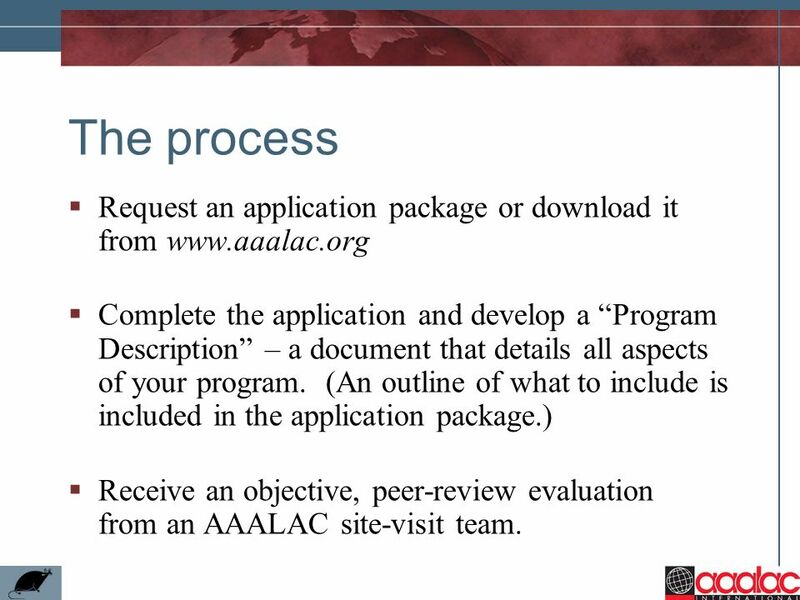 AAALAC International History, Programs and Process. 3 What is AAALAC? 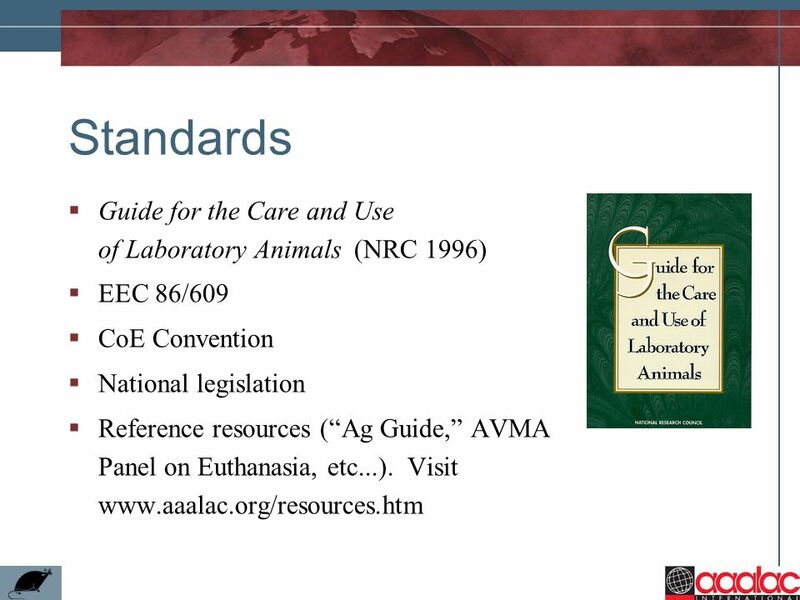 AAALAC stands for the Association for Assessment and Accreditation of Laboratory Animal Care International. 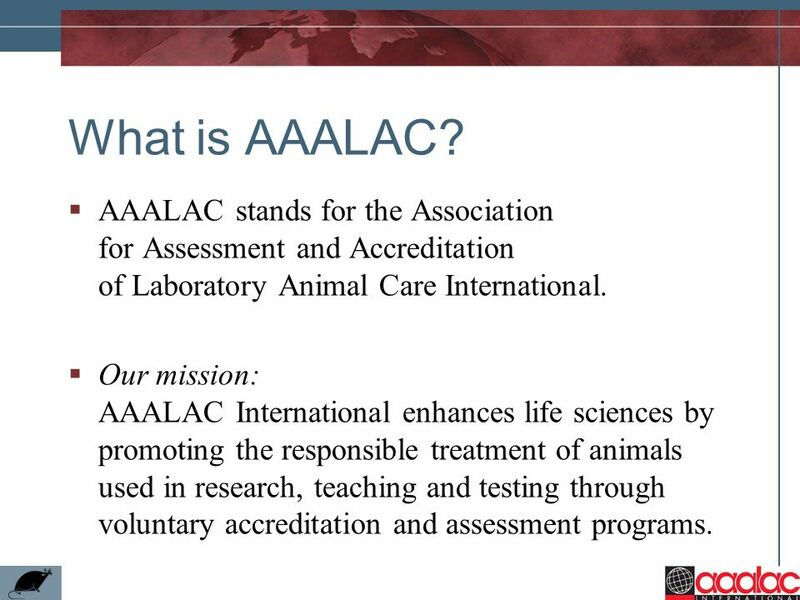 Our mission: AAALAC International enhances life sciences by promoting the responsible treatment of animals used in research, teaching and testing through voluntary accreditation and assessment programs. 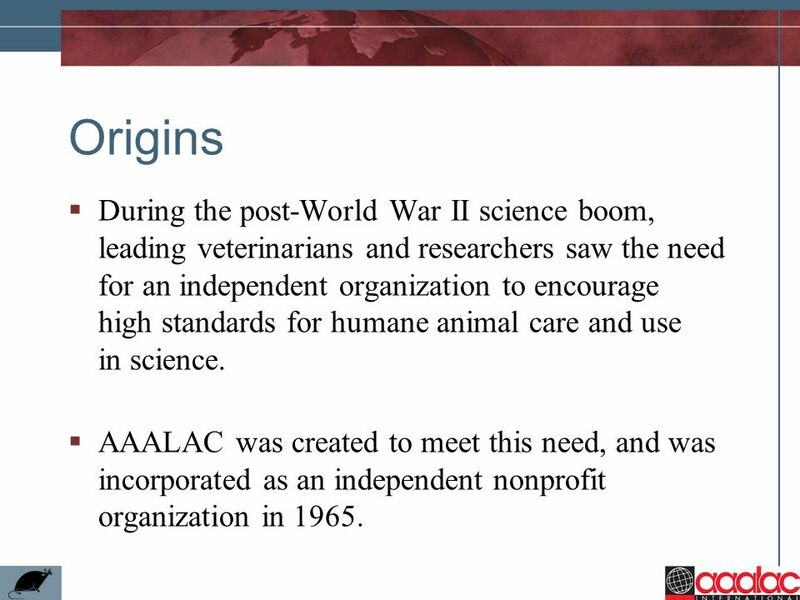 4 Origins During the post-World War II science boom, leading veterinarians and researchers saw the need for an independent organization to encourage high standards for humane animal care and use in science. AAALAC was created to meet this need, and was incorporated as an independent nonprofit organization in 1965. 5 Growth AAALAC accredits universities, companies, government agencies, and nonprofit organizations. 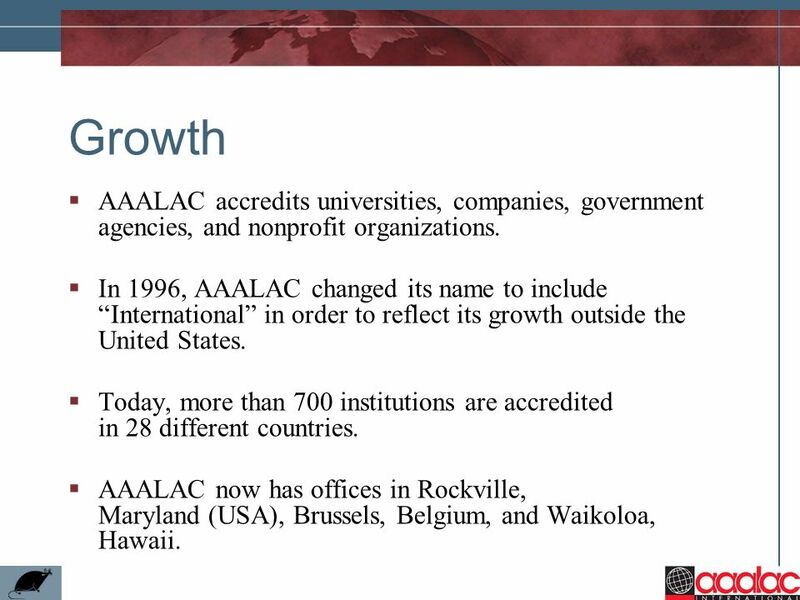 In 1996, AAALAC changed its name to include “International” in order to reflect its growth outside the United States. Today, more than 700 institutions are accredited in 28 different countries. 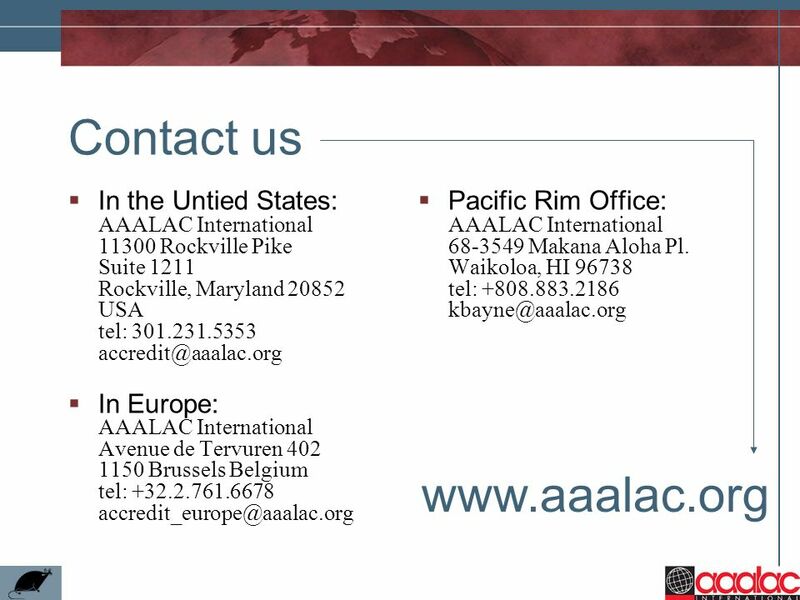 AAALAC now has offices in Rockville, Maryland (USA), Brussels, Belgium, and Waikoloa, Hawaii. 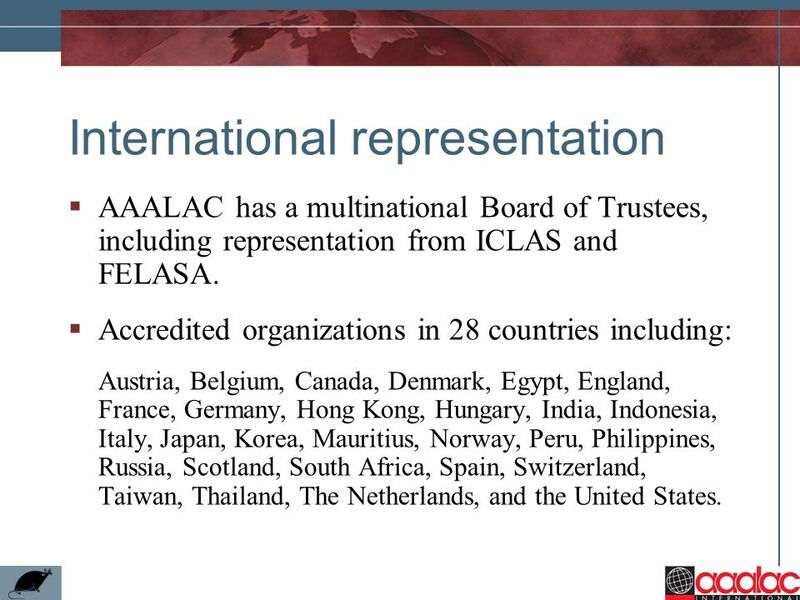 AAALAC has a multinational Board of Trustees, including representation from ICLAS and FELASA. Accredited organizations in 28 countries including: Austria, Belgium, Canada, Denmark, Egypt, England, France, Germany, Hong Kong, Hungary, India, Indonesia, Italy, Japan, Korea, Mauritius, Norway, Peru, Philippines, Russia, Scotland, South Africa, Spain, Switzerland, Taiwan, Thailand, The Netherlands, and the United States. 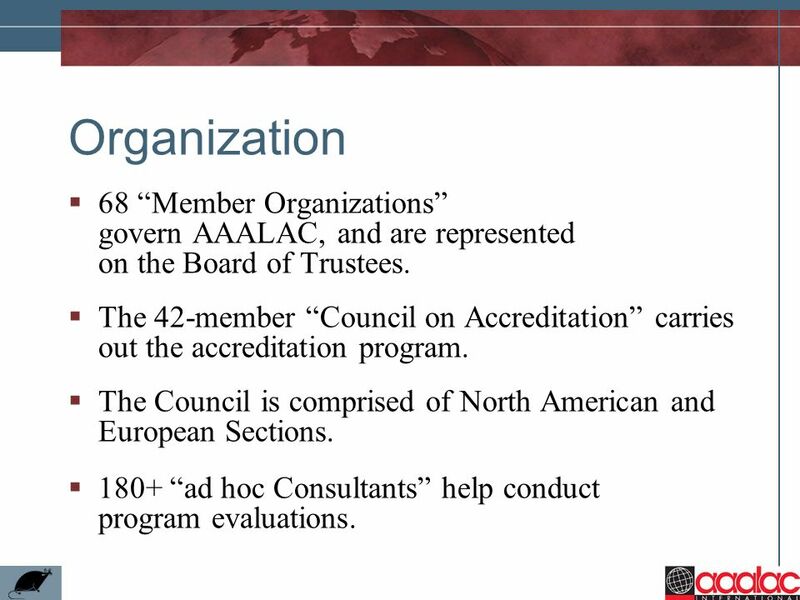 7 Organization 68 “Member Organizations” govern AAALAC, and are represented on the Board of Trustees. The 42-member “Council on Accreditation” carries out the accreditation program. The Council is comprised of North American and European Sections. 180+ “ad hoc Consultants” help conduct program evaluations. 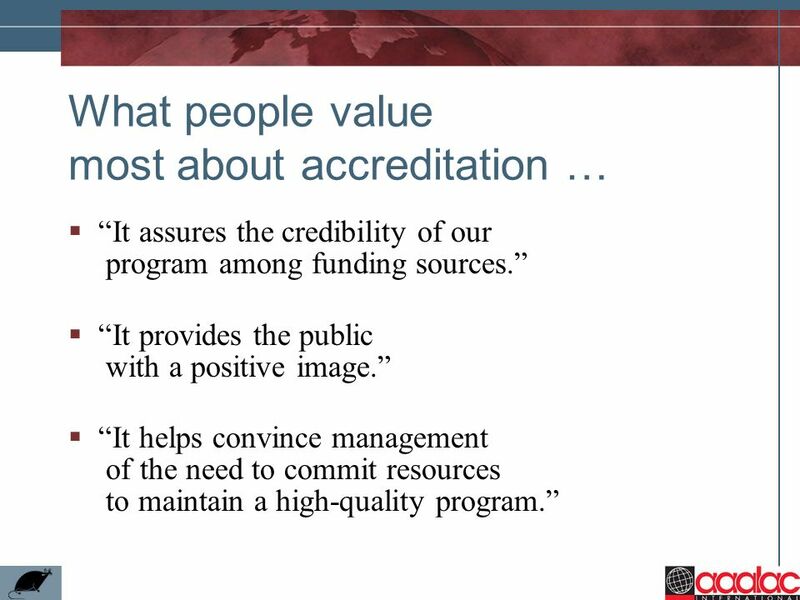 8 Accreditation … Is completely voluntary and confidential. Is performance-based. Is a peer-review process. 11 The process Request an application package or download it from Complete the application and develop a “Program Description” – a document that details all aspects of your program. (An outline of what to include is included in the application package.) Receive an objective, peer-review evaluation from an AAALAC site-visit team. 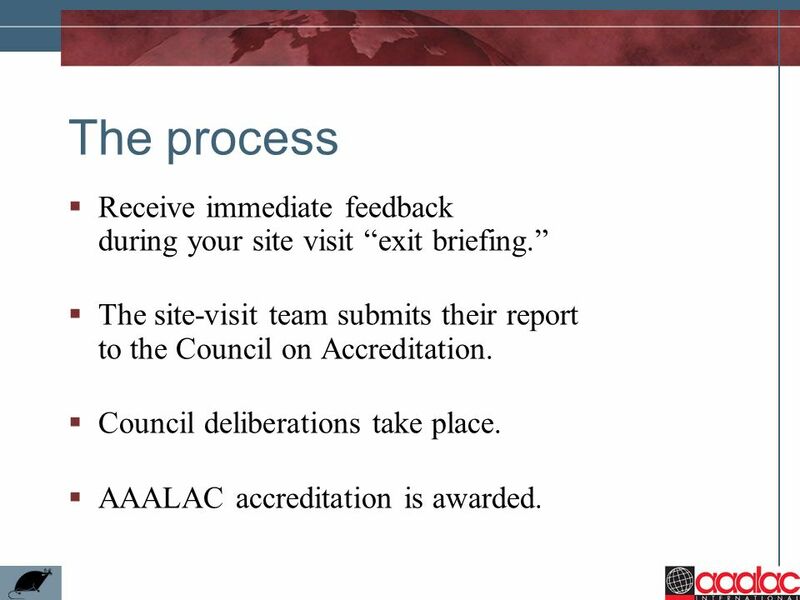 12 The process Receive immediate feedback during your site visit “exit briefing.” The site-visit team submits their report to the Council on Accreditation. Council deliberations take place. 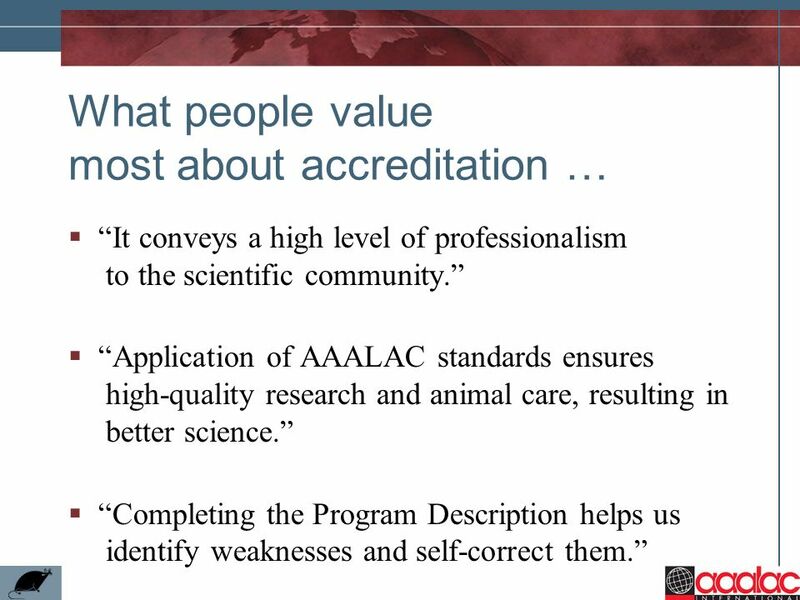 AAALAC accreditation is awarded. 13 Fees Fees cover the direct cost of the site visit plus administrative expenses. There is a one-time application fee. Accredited institutions pay an annual fee. 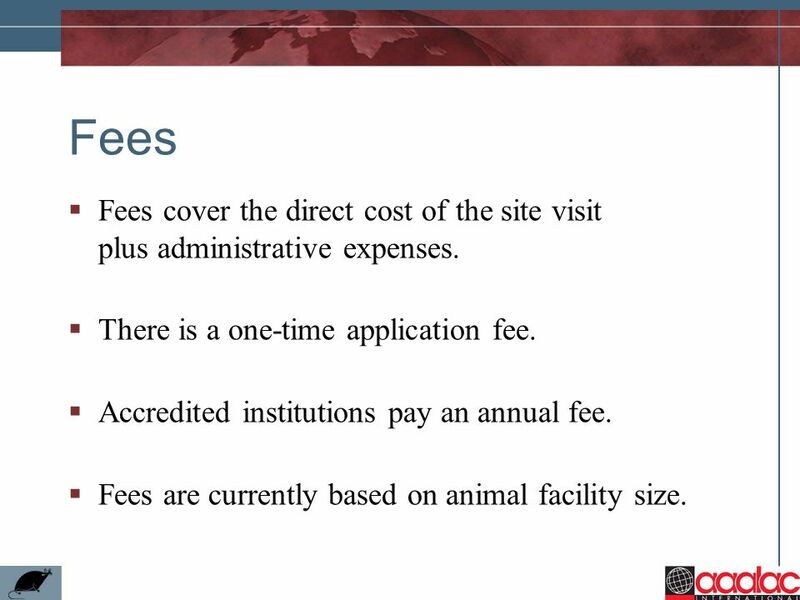 Fees are currently based on animal facility size. 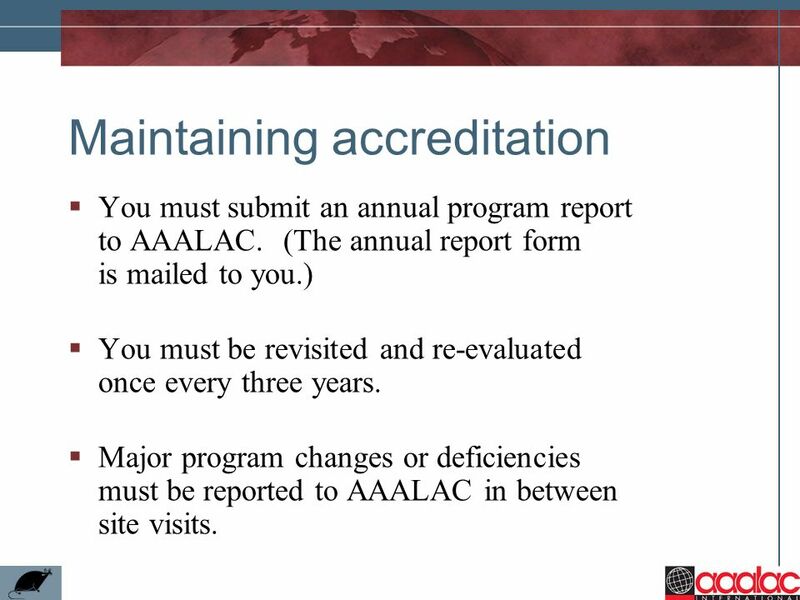 You must submit an annual program report to AAALAC. (The annual report form is mailed to you.) You must be revisited and re-evaluated once every three years. Major program changes or deficiencies must be reported to AAALAC in between site visits. 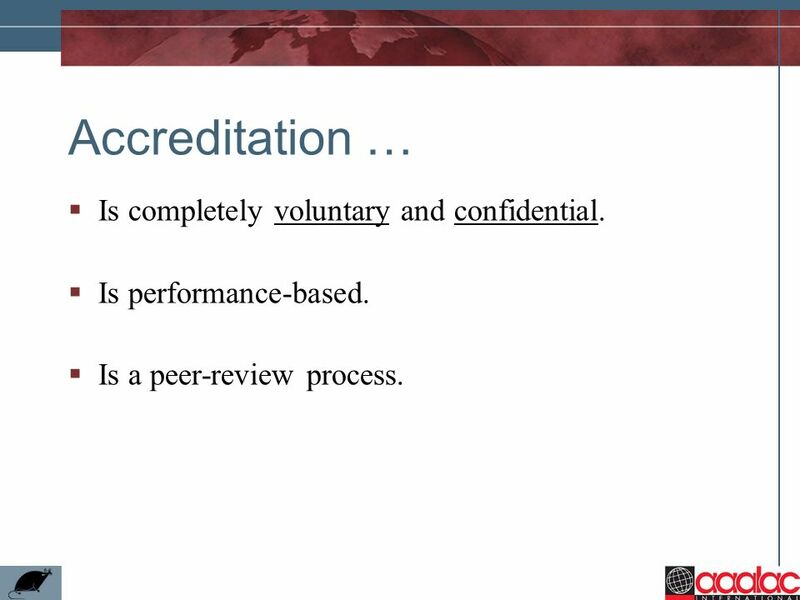 15 Accreditation … Provides a confidential, third-party peer review. Promotes scientific validity. Represents quality. Demonstrates accountability. Assures funding sources. Helps recruit quality people. Shows a real commitment to humane animal care. 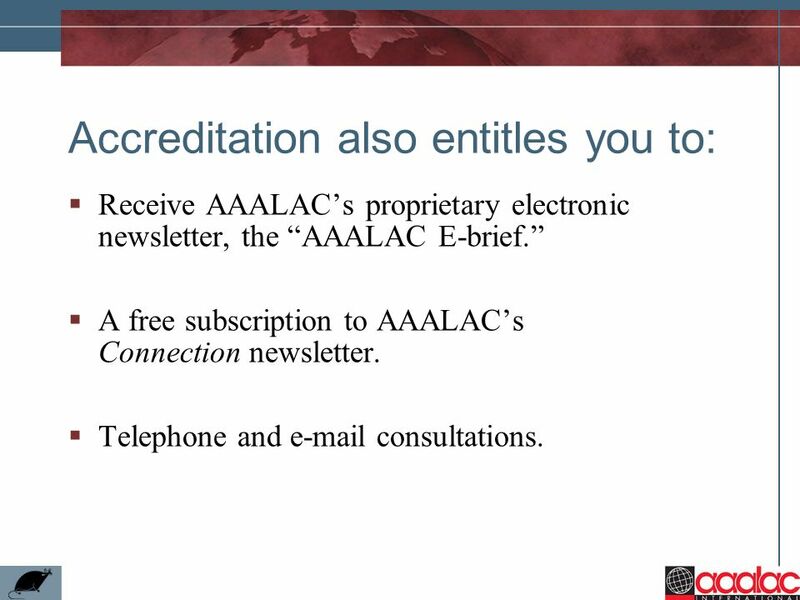 Receive AAALAC’s proprietary electronic newsletter, the “AAALAC E-brief.” A free subscription to AAALAC’s Connection newsletter. Telephone and consultations. 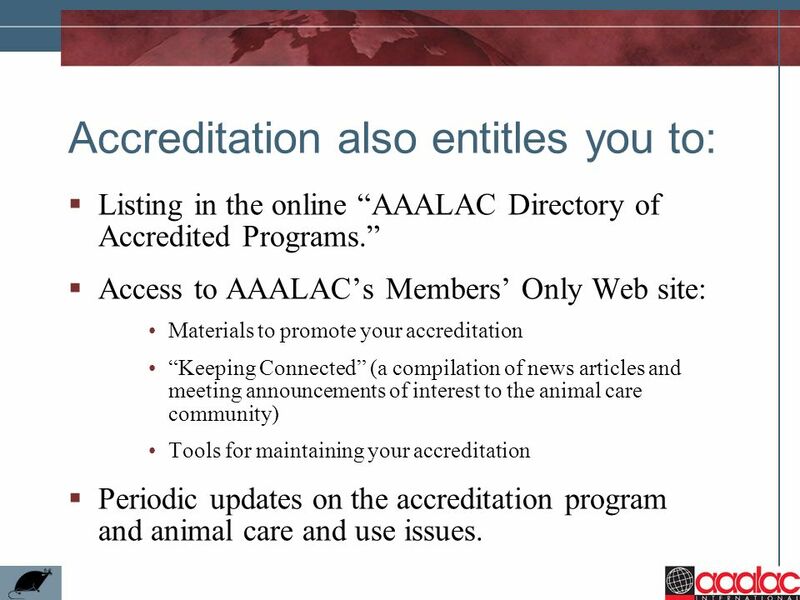 Listing in the online “AAALAC Directory of Accredited Programs.” Access to AAALAC’s Members’ Only Web site: Materials to promote your accreditation “Keeping Connected” (a compilation of news articles and meeting announcements of interest to the animal care community) Tools for maintaining your accreditation Periodic updates on the accreditation program and animal care and use issues. 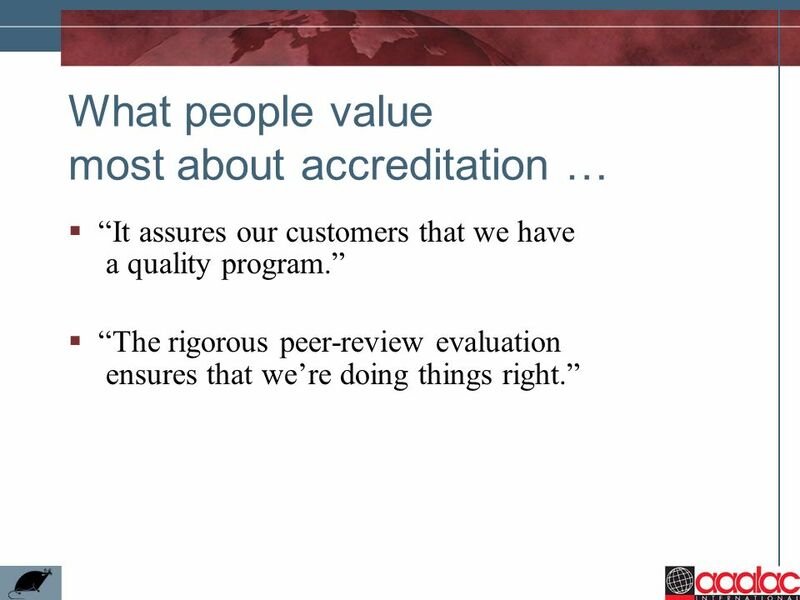 Separate from the accreditation program. 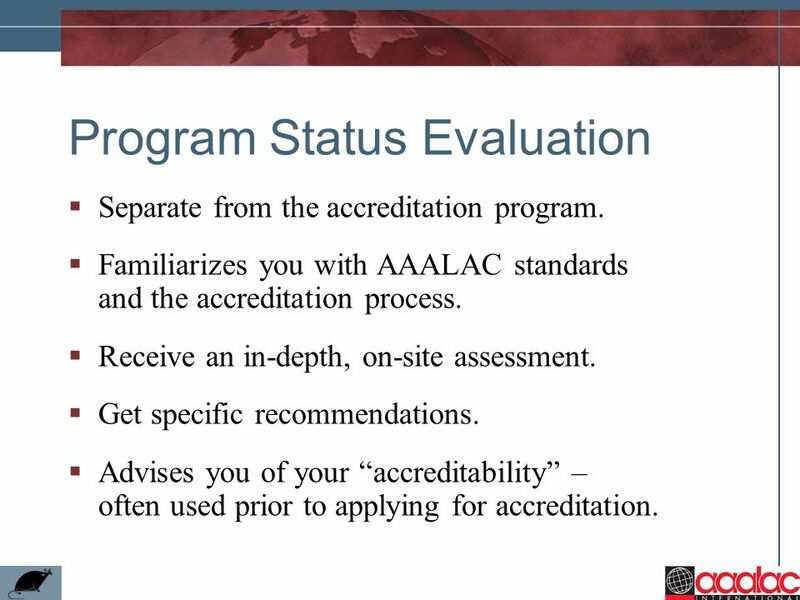 Familiarizes you with AAALAC standards and the accreditation process. Receive an in-depth, on-site assessment. Get specific recommendations. Advises you of your “accreditability” – often used prior to applying for accreditation. 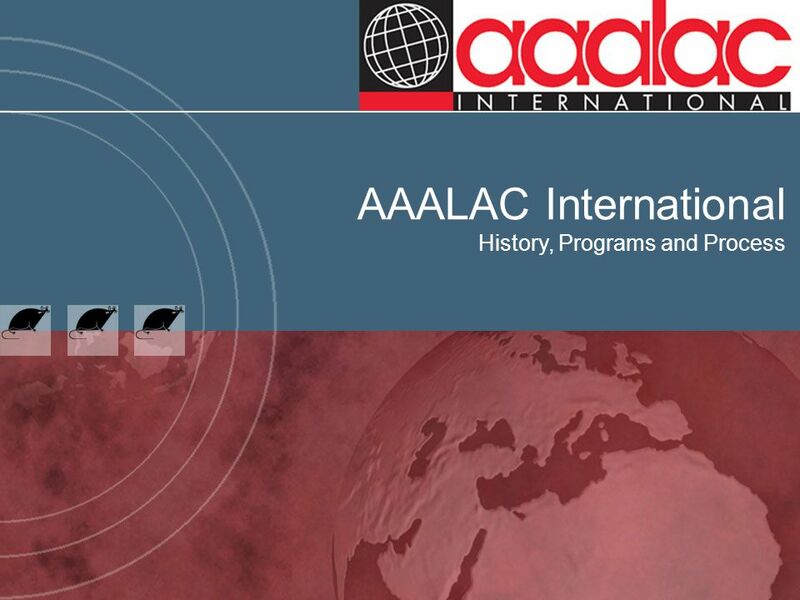 Download ppt "AAALAC International History, Programs and Process." What is AAALAC International?. What is AAALAC Int.? 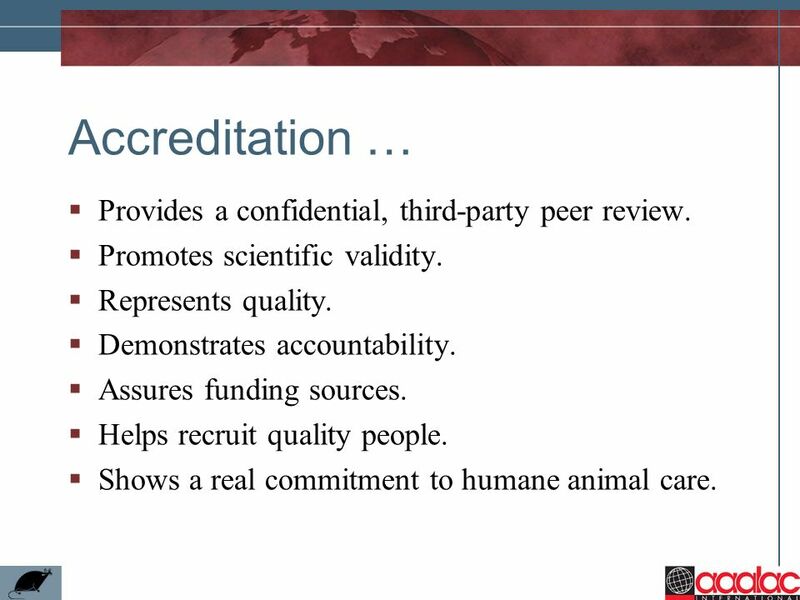 Accreditation and assessment for animal care and use programs. Completely voluntary and confidential. Starting an ESC Chapter in Your State. Energy Services Coalition Mission To promote the benefits of, provide education on, and serve as an advocate for. European Association of Establishments for Veterinary Education and Evaluation of the „Vet-Schools“ Brussels, 6 October 2008 Marcel Wanner. © 2013 Ipsos. All rights reserved. Contains Ipsos' Confidential and Proprietary information and may not be disclosed or reproduced without the prior written. The Freedom to Publish Opinion Poll Results June 15, 2012 Presented by Dr. Robert Chung Director of Public Opinion Programme, The University of Hong Kong. SACS CASI Background Dedicated to advancing excellence in education worldwide, AdvancED provides accreditation, research, and professional services to. Understanding AQIP (Academic Quality Improvement Project) Some slides and/or information have been borrowed with permission from their originators: 1. Official Languages: English and French. International Civil Aviation Organization (ICAO) recognizes the Academy as an International Non-Government Association. REPORT ON THE RESPONSES TO THE IEPC QUESTIONNAIRE AND SOME THOUGHTS ON THE DEVELOPMENT OF THE IAEP Chris Daykin, Executive Director, IAA Fund. 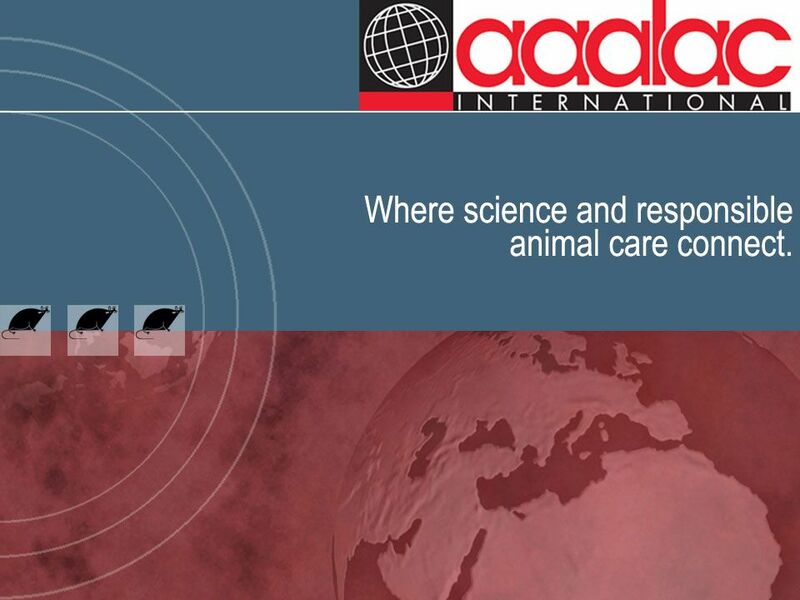 Public and Private Interests in Animal Research LAT Chapter 1. A specialized accrediting agency for English language programs and institutions Accreditation Presentation ABLA conference 2012. Users and Uses of IPUMS International Data Presented by Dr. Miriam King. 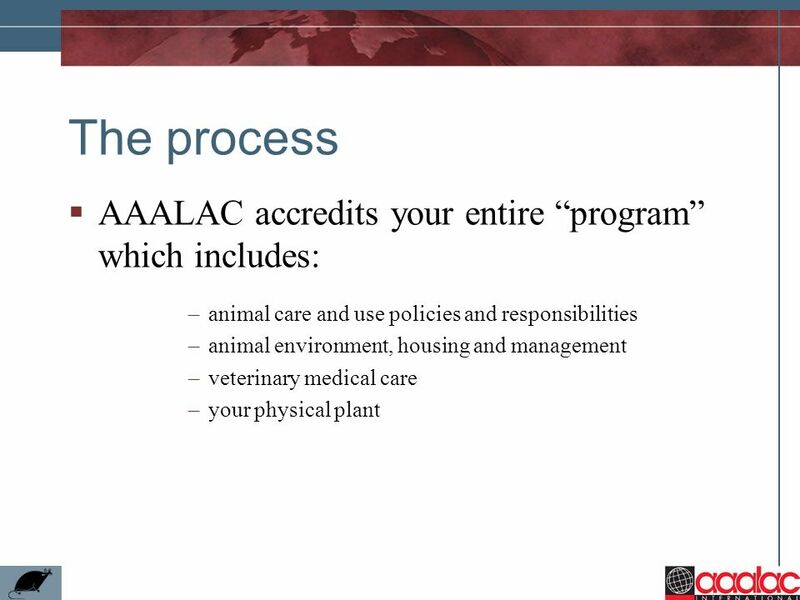 International Benchmarking: AAALAC International Accreditation Kathryn Bayne, MS, PhD, DVM, DACLAM, CAAB Senior Director & Director of Pacific Rim Activities. © Lloyd’s Regional Watch Content Guide CLICK ANY BOX AMERICAS IMEA EUROPE ASIA PACIFIC. SPC Advisory Committee Training - TAC Fall 2015 Institutional Research President’s Office 1 Abridged from the SPC Advisory Committee Training on October.